Can an Old Man Logan Movie Work Without Marvel Characters? Though Hugh Jackman and others have outright denied it, many fans still believe Wolverine 3 is going to be based on the classic Marvel comic story 'Old Man Logan', written by Mark Millar. One of the detracting factors from this becoming a reality is the fact that the comic book featured characters owned by Disney and Marvel Studios. Ones they're probably not willing to share. Hawkeye, who is a key player in Marvel's The Avengers, is also the secondary character in 'Old Man Logan'. Other characters include She-Hulk, King Pin, Red Skull and Black Bolt, just to name a few. Well, Mark Millar doesn't think that matters. In fact, he believes the story is strong enough to stand on its own without the help of these other Marvel owned characters. Over the summer, Hugh Jackman asked fans to send him ideas for Wolverine 3. At the top of everyone's wish list was seeing 'Old Man Logan' brought to life on the big screen. During Comic-Con this past July, Hugh Jackman joked that it was going to serve as the basis for the script, and some fans took him a little too seriously. 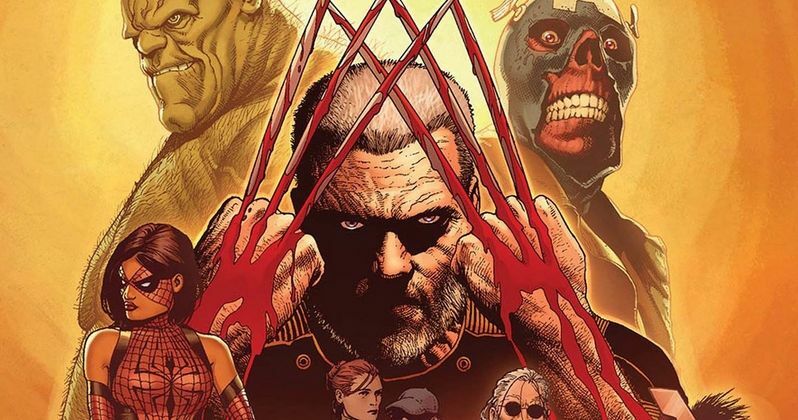 As far as we know, 'Old Man Logan' simply isn't happening. But Mark Millar hints that it should. Speaking with IGN, he explained how it could definitely work. Honestly, the continuity stuff is the most boring side of it. I kind of like it, keeping it in the X-Men universe a little, too, because comic fans are different from the mainstream world. I know this stuff backwards because I've lived my whole life loving this stuff, but most people don't know the entire minutia and everything so I think keeping it simplified and keeping it generally X-Men universe is a smarter thing to do. Earlier this week, Hugh Jackman confirmed that Patrick Stewart has a pretty substantial role as Professor X in Wolverine 3. The sequel will explore their father-and-son relationship, driving to the deep core of their personas. Some believe that Xavier will take over the Hawkeye role if 'Old Man Logan' truly is what's being cooked up by director James Mangold and Hugh Jackman. According to the actor, the story treatment is at 90%, with over an hour's worth of script already written. If that's the case, Fox could easily substitute other Marvel characters with characters from the X-Men franchise, and still have the story make sense. While the Hulk plays a huge role in 'Old Man Logan', Mark Millar suggests that he could easily be replaced by The Blob. And it's possible to bring in Cyclops with out altering Logan's character arc from the comic book. At this point, it seems unlikely that Marvel would be willing to strike a deal with Fox that sees them sharing any of these characters. Unless, of course, maybe it meant bringing Wolverine into the Avengers. Perhaps Hugh Jackman would appear as Logan one more time for that? X-Men: Days of Future Past is a good instance of taking a Marvel comic book story arc and changing it to fit the franchise. The movie was a hit with fans and critics alike, despite it changing out characters that were more relevant to the movie series. It still managed to maintain its core elements and themes. While Wolverine took over Kitty Pryde's main character arc in the movie, thus changing the story fundamentally, the movie still remained true in spirit to what had come before it. The same could happen for 'Old Man Logan'.